Welcome to the Galactic Edition edition of RPGObjects' highly acclaimed Blood and Space 2 supplements. 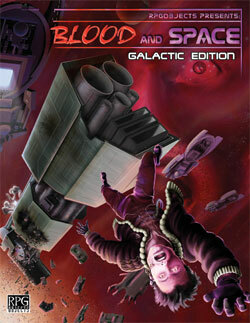 The Galactic Edition collects a bluk of the Blood and Space 2 series of ebooks into one definitive volume. This book endeavors to add new options and spice to future d20 games revolving around starships and space combat. New allegiances, classes, skill uses, and feats to make space combat more interesting and exciting in your futuristic d20 games. Expanded crew rules that build on those found in the future core rules. An extensive collection of terrain rules from gravity wells to super novas. Designed to be completely compatible with both the future d20 core rules for starship construction, this book gives you the ability to create your own hull types and build weapon variants from scratch. New humanoid and ship sized space creatures. Prometheus Rising is the signature setting for Blood and Space. This product has Modern Character Generation support.